The C53A proportioning valve is what you want if you have a sedan converted to rear disc brakes, a sedan AWD swap, or even a FWD sedan 4G63 swap. The rear bias is very weak on a rear drum sedan. "The proportioning valve from the C66 Lancer need to be swaped from a all wheel brake disc ! We have found 42% ( Limit autorized in Europe 50% ) efficiency on the rear axle with the stock C66 valve ( drum brake ). If you use the C53 cables you need to reroute them because is 1 inch short approximately ! I hope its help for your swap..."
In summary, in the USA, the C53A and C52A proportioning valve is MB699640. This is the correct proportioning valve for a drum brake sedan that is converted to rear discs or you want more rear bias. 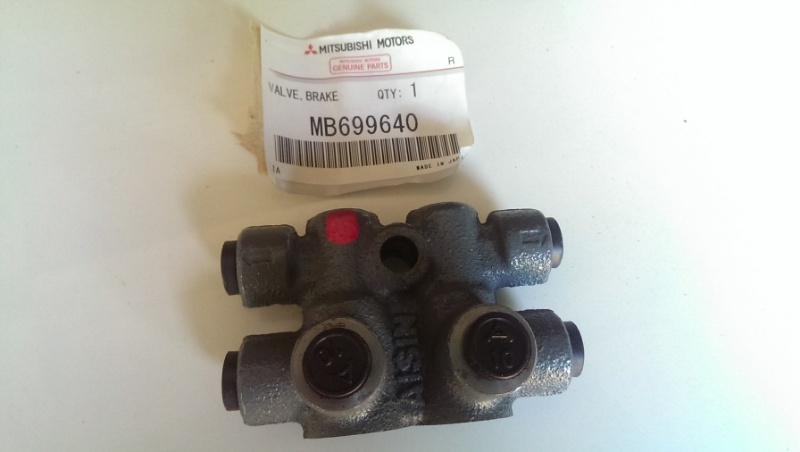 The MB699642 is the stock proportioning valve for the drum brake sedans C62A, C63A, and E18A (Galant Sigma 87-90ish). Not sure how or why the 1.6L N/A sedans with rear disc brakes would use this same proportioning valve. Got the last one from the mitsu warehouse in Atlanta. They said there was one more at a dealer in Florida. They weren't sure if they could order more from Japan. Will post results of going from the rear drum prop valve to this one. First impression, braking is noticeably different and better. Feels more balanced, I don't feel the urge to gently pull the ebrake cable to "equalize" the braking. After some driving and spirited braking the front and rear rotors seemed equally hot. Before, I don't remember the rears being much more than cool or warm. I though you where running a 1g prop valve? Nope. It wouldn't be a bolt in affair. Front Rallyguy big brake kit - 4 piston Wilwood dynalite front calipers, GVR4 slotted rotors and BP-20 pads. Did you notice any difference in the bias before the big brakes where put in the front? Or I guess the question is; is the bias supposed to collate to the size difference or braking capacity difference between the front brakes vs the rear brakes? With the drum brake prop valve and the big brakes it's way off. With the new prop valve it's better, but not ideal. I'm sure I'd need an adjustable one to be perfect. I have just placed an order for the MB316180 or MB699640 (# superceded to) and it should be coming from Japan. Lots of little parts were populating with amayama but 80% probability of stock turned into no longer in production. That is fine for gas pedal return springs and other little do dads, but the brake proportioning valve comes up with the part number change from original and the order is processing. Also sadly, the hood insulator is no longer available from that avenue of ordering. I am however getting the retainer wire forms brand new. My prop valve is just fine from what I can tell, but I would like a backup. I'm running the prop valve from a 3g eclipse GT, it looks a lot like the stock unit, only bigger slightly then the drum version, but now I wonder what the difference is from using the genuine "89 C/M GT unit... ...oh well I suppose I used the right valve, the more I think about it I am using the dual piston front brakes, and the 2001 gt eclipse that I pulled it from had the twin pistons up front, and the rear discs. The only thing the proportioning valve does is provide a split point for pressure and volume of fluid going to the front and rear brakes, this can change how the brakes react. If you can find the split point information for the car you removed one from, then you know what information to work with and how it affects your system.